where the civil rights movement unfolded. murders, marches and triumphs. Among them, bus stops, lunch counters, a bridge and schools. for the civil rights movement. street sign with Hank Williams. 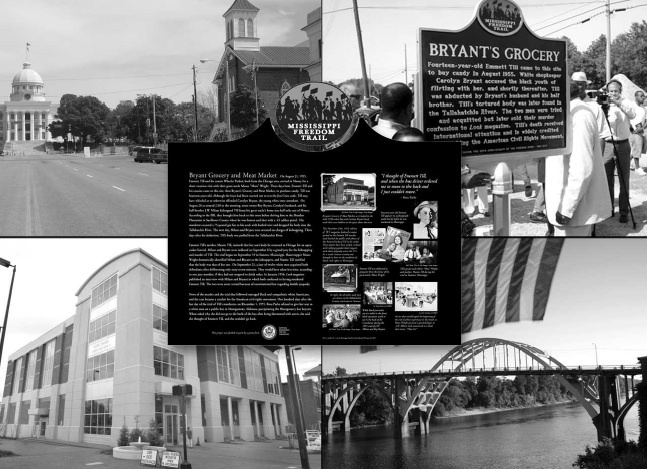 Clockwise from top left: The Alabama Capitol with Dexter Avenue Church at right; the Bryant's Grocery marker in Mississippi; the Edmund Pettus Bridge, site of the "Bloody Sunday" conflict on March 7, 1965; the Rosa Parks Museum; Inset: the back panel of the Bryant's Grocery marker. take staff time and money, according to Stephen Morris, chief of international affairs at the National Park Service. and fear that surrounded blacks. officials felt a chill, recalled Ward Emling, Mississippi’s manager of film and cultural heritage, in an interview. letting go and doing the right thing is a powerful statement,” he told me. state Their sacrifice eventually led to the election of 800 black people to public office. presidential aspirations but one that will lead to the first state-run, statewide civil rights museum in the United States. Mississippi’s consequential efforts are precisely the kind of story deserving of world heritage designation. This oped was published in the Washington Post Sunday Opinion page Aug. 28, 2011. This entry was posted in Uncategorized and tagged Washington Post, World Heritage Site on September 15, 2011 by jimcarrier.